Of late, opportunities to see and hear the term ‘satoumi’ are on the rise, thanks to international conferences on the topic. Satoumi is defined as marine and coastal landscapes that have been formed and maintained by prolonged interaction between humans and ecosystems. Although satoumi had a much later start than its inland forerunner, satoyama, it has now been nearly 10 years since debate sprung up in Japan over its definition. The consensus reached was that the concept should not be too narrow since a wide variety of good relationships between people and coastal seas exist. The Seto Inland Sea is one example. Located between the main island of Honshu and Shikoku, it is Japan’s largest enclosed sea and the location of the country’s first national park, which has garnered international recognition for its beautiful scenery. 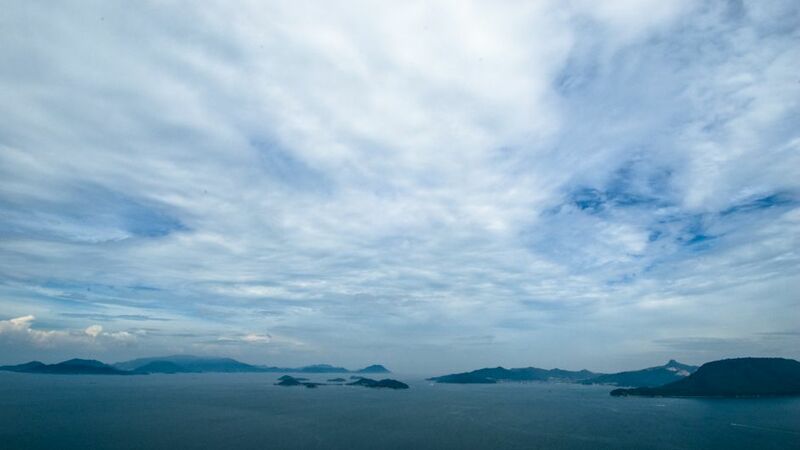 Since ancient times, the Seto Inland Sea has been a place where the ties between humans and the sea are very close. As far back as the Jomon period, the sea was not only a rich food source for the people who gathered fish and shellfish along its shores, but there is also evidence that it served as shipping and trade route. The salt industry too is an important speciality here and has a deep connection to satoyama. From a historical perspective, the white sands and blue pine trees for which the coastline is famous were a result of the massive quantity of trees that were cut to fuel salt production and other activities prior to the switch to petroleum sources after World War II. This practice led to white beaches comprised of crumbled granite where the pines were planted because they were the only trees tough enough to grow on such barren land. Satoumi is defined as marine and coastal landscapes that have been formed and maintained by prolonged interaction between humans and ecosystems. 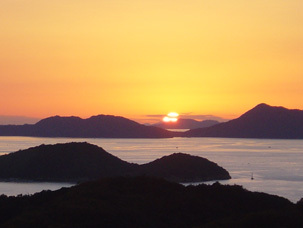 Archipelago of the Seto Inland Sea (Bisan Seto Region). So the rich bounty and beautiful scenery that the Seto Inland Sea’s satoumi provides is a product of the long-held links between people’s livelihoods and the coastal waters. While there are many accepted forms of satoumi — as it reflects regional characteristics and historical circumstance — the concept here is, in short, that the coastal waters saw an increase in productivity and biodiversity thanks to human interaction. Overall, this fertile satoumi remained intact until after World War II, since human activity had relatively little impact on the marine environment and resources. The situation changed drastically during the period of high economic growth in the decades following. Environmental contamination due to pollution (from both industrial and household sources) and the disappearance of shallow seas due to landfill projects all led to a decline in marine resources and the deterioration of the overall ecosystem. The situation was so bad that the area was often referred to as the ‘Dying Sea’. Efforts to combat pollution and a movement toward environmental conservation gained momentum as early as 1973 when the Law Concerning Special Measures for Conservation of the Environment of the Seto Inland Sea was first enacted (it was later enacted permanently in 1978 as a special measure). This lawmaker-initiated legislation was a rarity in Japanese politics at the time. Over the past few years, the coastal waters of Japan, including the Seto Inland Sea, have reached a further turning point. One major factor has been a succession of legislation and strategies directly impacting the administration of coastal environments and resources. 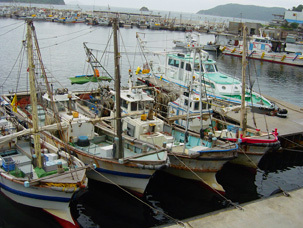 Fishing boats gathering in a harbour on the Seto Inland Sea (Bouze Island). For example, the Basic Plan on Ocean Policy (approved by the Japanese Cabinet in March 2008) points out the need to secure biodiversity in order to maintain marine resources and the aquatic environment while also highlighting the importance of the satoumi concept. Concrete action has been taken by the Ministry of Environment through the initiation of the Assistance Program for the Creation of Satoumi, which was followed by the selection of Coastal Areas Under Assistance in August 2008. The National Strategy for the Conservation and Sustainable Use of Biological Diversity (cabinet approved November 2007) states the need for “the protection of coastal waters that have been designated satoumi”. Following these objectives, the Assistance Program for the Protection of the Environment and Ecosystem was established by the Fisheries Agency in 2009. Many more pioneering efforts have contributed to the Seto Inland Sea being referred to as the “experimental waters for environmental management” on occasion. While the governors and mayors conference for the environmental conservation of the Seto Inland Sea has taken the lead in attempts to undo the damage of decades past, a proposed revitalization of the Seto Inland Law has been encouraged by a petition that has already gathered the signatures of over 1.4 million supporters. Non-governmental organizations have also played important roles in conservation and restoring coastal area, in particular of the deteriorated tidal flats and seaweed beds. International trends towards the management of coastal areas have been leaning toward Integrated Coastal Management for quite some time now. However, we can likely anticipate a new and unique form of integrated management for Japan’s coastal waters through the linking of satoumi and satoyama initiatives. Though Japan’s coastal waters have always been subjected to human activity, the country has never established any form of a unified management system for land and sea. For the future, it will be vital that management mechanisms for coastal waters can move at least one step closer to integrated regional management wherein land and sea are brought under unified policy. By bringing the beauty of the island-studded scenery to the front and centre, Seto Inland Sea National Park has the full potential to become a model for the integrated management of satoumi and satoyama. Satoumi: the link between humans and the sea by Osamu Matsuda is licensed under a Creative Commons Attribution-NoDerivs 3.0 Unported License. Dr. Osamu Matsuda is Chairman of Seto Inland Sea Research Conference and Professor emeritus of Hiroshima University. Since 1971, Mr. Matsuda has studied and conducted research on the Seto Inland Sea and on enclosed coastal seas at Hiroshima University. He specializes in material cycle theory, management of coastal environments and nature restoration. He has conducted fieldwork worldwide including in the Arctic Sea, Antarctic Sea, tropical zones, as well as the North and South Pacific. His publications include Turning the Seto Inland Sea into Satoumi, Studying the Link Between Forest, Land and Sea (Kyoto University Press), and An Introduction to Marine Issues (Maruzen). Oftentimes satoyama forest management is discussed in terms of less-invasive procedures such as thinning in order to increase productivity and biodiversity, whereas in the salt production example here it appears that original forests all but disappeared for the sake of industry, though it is still framed as a positive for biodiversity and productivity. I’d imagine that at the time of maximum salt production there was more an ethic of opportunistic exploitation and economic survival than balanced, harmonious respect for nature, and the outcome of beautiful landscapes at present speaks more for the healing power of nature itself (and, of course, the sincere and successful efforts of the Seto Inland Sea environmental initiatives from 1973). Ultimately, it seems to me that sustainable satoumi and satoyama landsacapes flow from a worldview in which people recognize we’re all part of nature, that what we do to nature we’re doing to ourselves, and that mining any resource (using it up beyond rates of renewal) is ultimately detrimental to the whole of who we are.